Even among the most avid TC movie fans it is not widely known that the original venue for King Kong was not Manhattan. In this rarely seen storyboard view of Kong's climactic ascent, the Temple Theater and not the Empire State Building was the king's hideout. In a typical Hollywood blunder we see the area to the east of the theater as a thick redwood forest, hardly in keeping with the actual local vegetation. Does Garfield pass through TC? Not the street, the president! After about an hour on Ancestry.com last fall, I found that Temple City founder Walter Pablo Temple’s father F.P.F. Temple, was the son of Jonathan Temple and Lucinda Parker (1779-1856), who was the daughter of Caleb Parker and Hannah Garfield (1750-1816), who was the daughter of Thomas Garfield 1713-1774. Temple Name Goes Back to Tenth Century, or does it? An hour or so on Ancestry.com can be interesting. TC founder Walter P. Temple's paternal New England line crosses from England in the 1630s. That much is probably true; it can be documented in the census from 1790 and from town and church records for the other 150 years of the colonial period, beginning with the immigrant Abraham Temple. Albertsons or ...? That is the question. According to the Star News, the TC Albertsons at the southwest corner of Rosemead and Las Tunas will close in April 2009. No plans have been announced for the location, which has served the community for about 30 years. UPDATE: 2018 -- And so it was written that the Albertson's and its neighbors did verily into history pass, joining the Temple Theater and other landmarks in the great gazeteer of history. 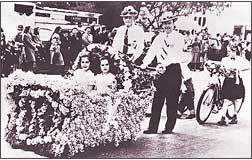 This year's Camellia Festival and Parade is scheduled for February 28. Local Facts: Temple City, CA 91780 - Population est. 35,616. Located in Los Angeles County. Founded 1923. Developed along E-W Pacific-Electric streetcar line. City incorporated 1960.